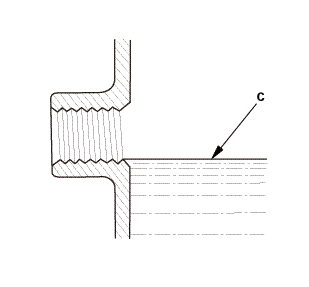 If the boot band is a welded type (A), cut the boot band. 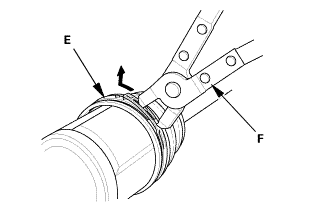 If the boot band is a low profile type (E), pinch the boot band using commercially available boot band pliers (F). 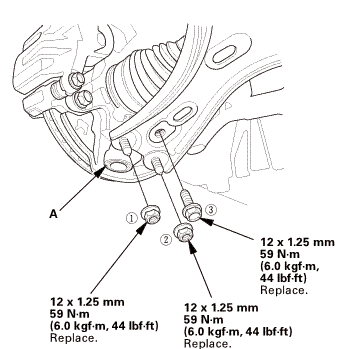 If the boot band is an ear clamp type (G), lift up the three tabs (H) using a flat-tipped screwdriver. 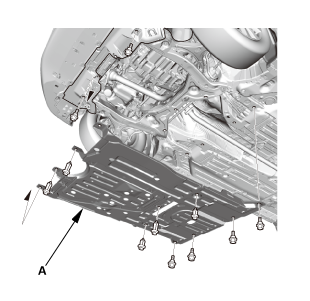 Make marks (A) on each roller (B) and the inboard joint (C) to identify the locations of the rollers to the grooves in the inboard joint. 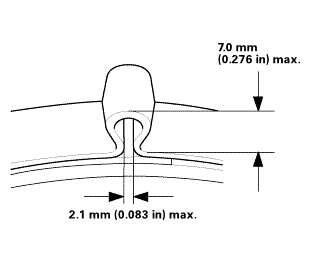 NOTE: Do not engrave or scribe any marks on the rolling surfaces. 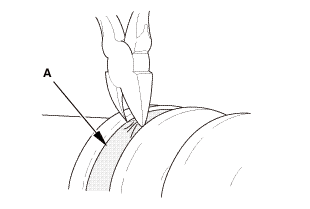 Remove the inboard joint on a clean shop towel (D). 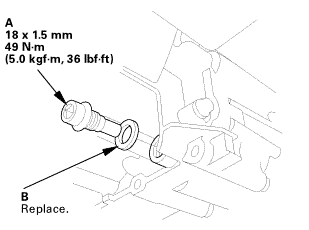 NOTE: Be careful not to drop the rollers when separating them from the inboard joint. 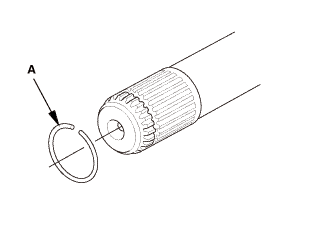 Japan-produced: Make marks (A) on the spider (B) that match the marks on the rollers. 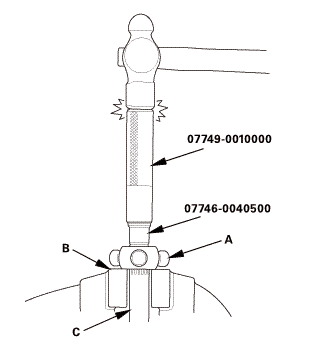 Japan-produced: Make marks (C) on the spider and the driveshaft (D) to identify the position of the spider on the shaft. 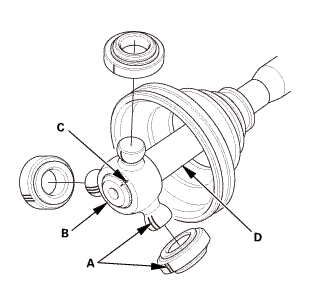 Japan-produced: Make a mark (A) on the driveshaft (B) at the same level as the spider end. 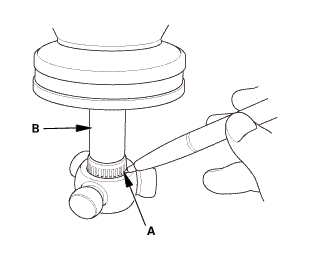 Japan-produced: Support the spider (A) on a bench vise (B). 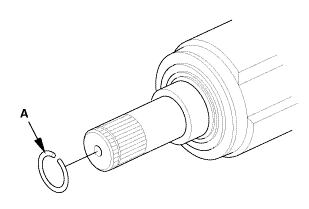 Japan-produced: Remove the driveshaft (C) from the spider using the 20 mm pilot and the 15 x 135L driver handle. 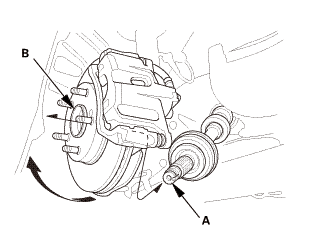 NOTE: Do not directly hit the driveshaft with the hammer. 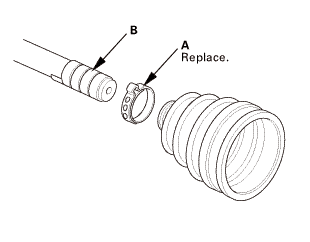 Japan-produced: Remove the circlip (A). 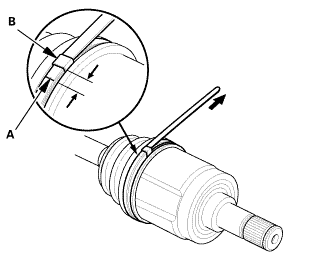 North America-produced: Make marks (A) on the spider (B) that match the marks on the rollers. 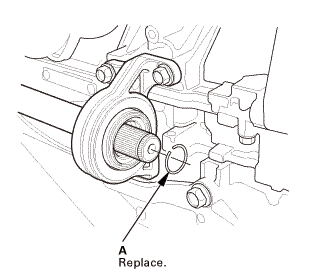 North America-produced: Remove the rollers. 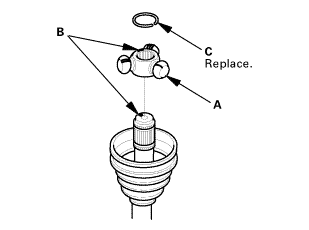 North America-produced: Remove the circlip (C). 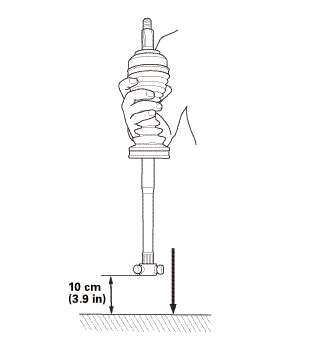 North America-produced: Make marks (D) on the spider and the driveshaft (E) to identify the position of the spider on the shaft. 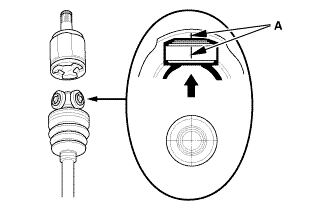 North America-produced: Remove the spider. 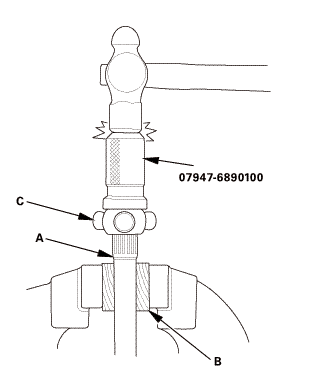 NOTE: If necessary, use a commercially available bearing puller while being careful not to damage the spider. 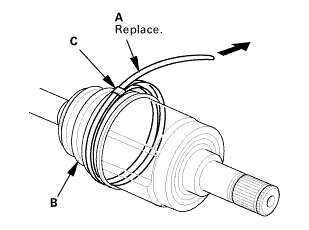 Wrap the splines on the driveshaft with vinyl tape (A) to prevent damaging the inboard boot. 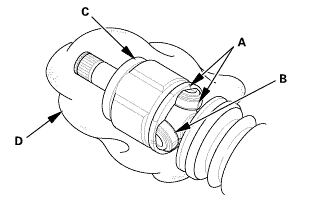 Ear clamp type: Install a new ear clamp band (A). 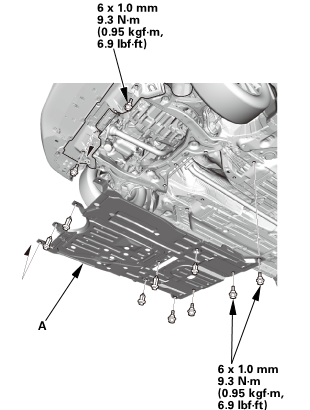 NOTE: Be careful not to damage the inboard boot. 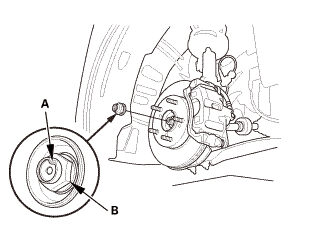 Remove the vinyl tape (B). 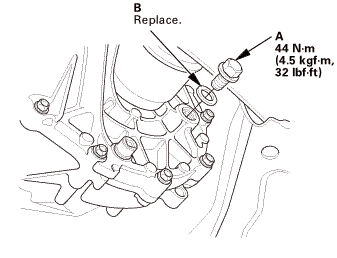 Japan-produced: Install a new circlip (A). 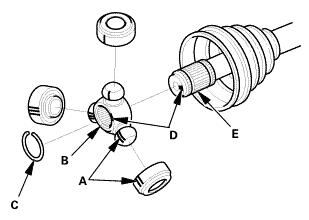 Japan-produced: Insert the driveshaft (A) into the spider (B) until the circlip (C) is close to the spider. 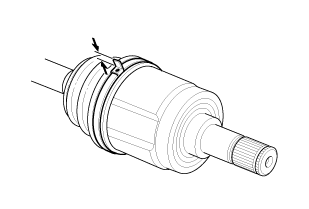 NOTE: Install the spider onto the driveshaft by aligning the marks you made on the spider and the end of the driveshaft. 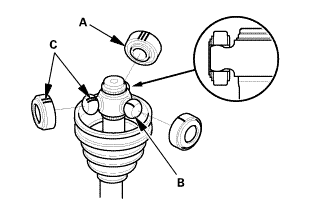 Japan-produced: Pick up the driveshaft and the spider, and tap or hit the assembly onto a hard surface from a height of about 10 cm (3.9 in). 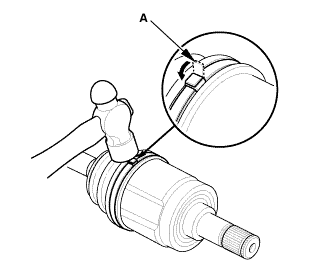 Japan-produced: Securely clamp the driveshaft (A) in the bench vise with wood blocks (B). 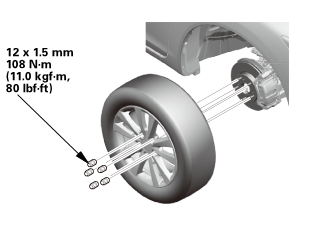 Japan-produced: Drive on the spider (C) using the 41.8 mm oil seal driver. 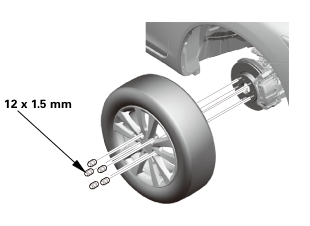 Japan-produced: Check the alignment of the paint mark (A) you made with the spider end. 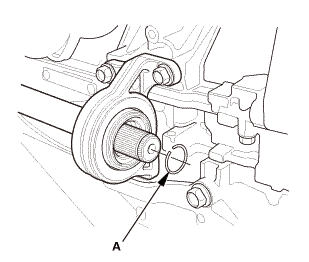 To avoid driveshaft and vehicle damage, the shaft must be all the way into the spider to ensure the circlip is properly seated. 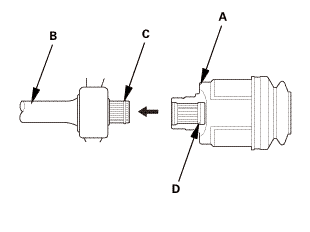 North America-produced: Install the spider (A) onto the driveshaft by aligning the marks (B) you made on the spider and the end of the driveshaft. 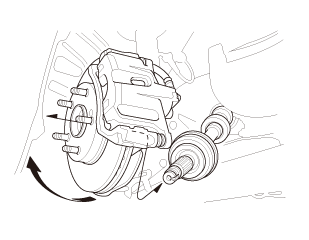 North America-produced: Install a new circlip (C). 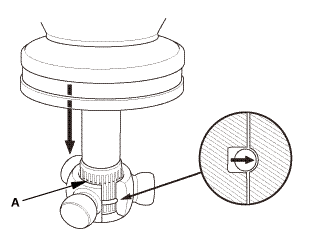 North America-produced: Always rotate the circlip in its groove to make sure it is fully seated. 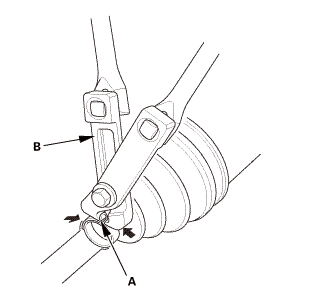 Reinstall the rollers in their original positions on the spider by aligning the marks (C) you made. 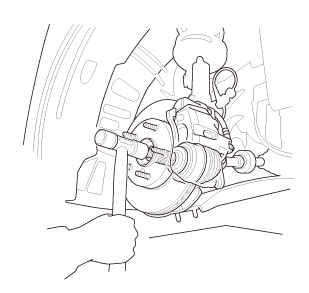 Hold the driveshaft pointed up to prevent the rollers from falling off. 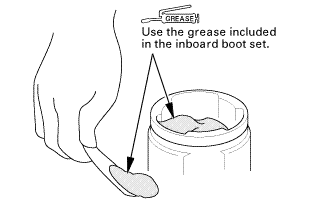 Pack the inboard joint with the joint grease included in the new inboard boot set. 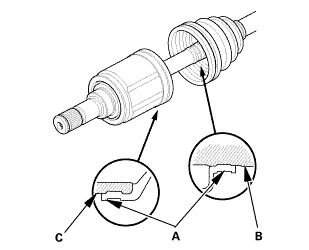 Reinstall the inboard joint onto the driveshaft by aligning the marks (A) you made on the inboard joint and the rollers. 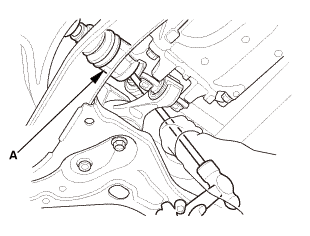 Hold the driveshaft so the inboard joint is pointing up to prevent it from falling off. 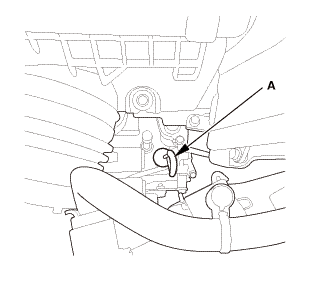 Fit the boot ends (A) onto the driveshaft (B) and the inboard joint (C). 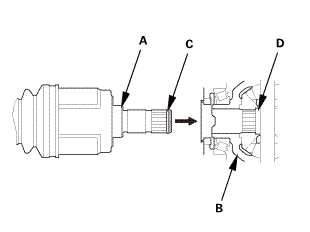 Adjust the length (A) of the driveshafts in the figure as shown, then adjust the boots to halfway between full compression and full extension. 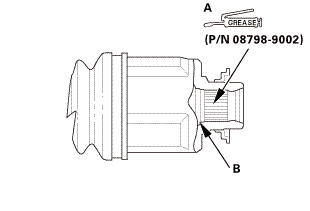 Bleed excess air from the boots by inserting a flat-tipped screwdriver between the boot and the joint. 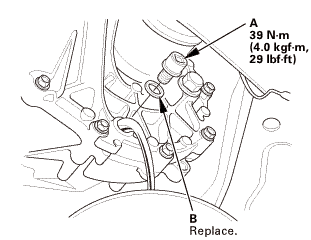 For the double loop type, go to step 16. 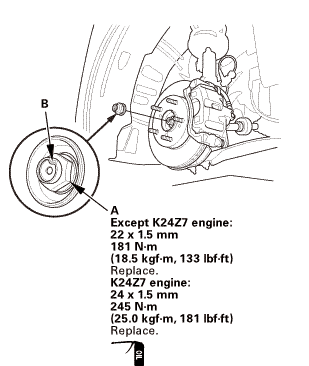 For the low profile type, go to step 27. 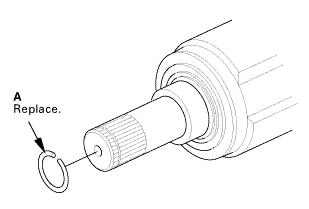 For the ear clamp type, go to step 31. 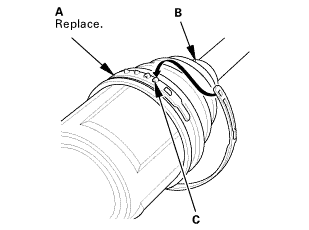 Install a new double loop band (A) onto the boot (B). 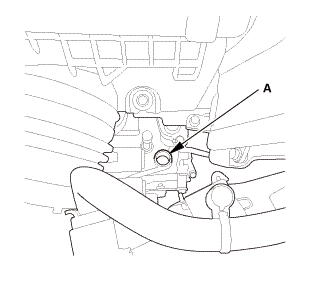 NOTE: Pass the end of the double loop band through the clip (C) twice in the direction of the forward rotation of the driveshaft. Pull up the slack in the band by hand. 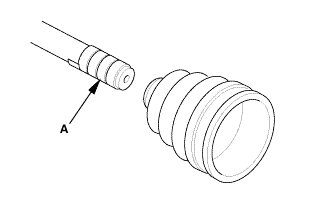 Mark a line (A) on the band 10－14 mm (0.39－0.55 in) from the clip (B). 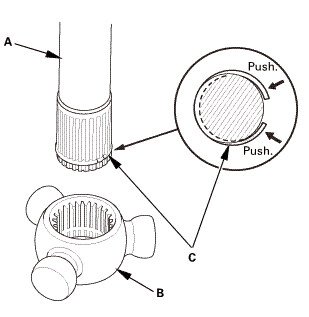 Thread the free end of the band through the nose section of the commercially available boot band tool (KD-3191 or equivalent) (A). 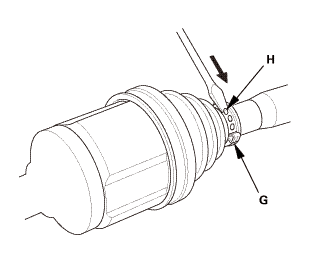 Into the slot on the winding mandrel (B). 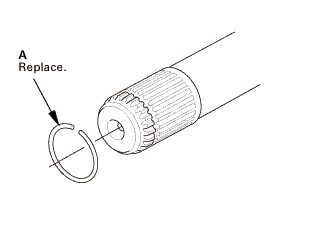 Using a wrench on the winding mandrel of the boot band tool, tighten the band until the marked line (C) on the band meets the edge of the clip. 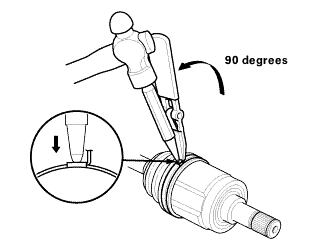 Lift up the boot band tool to bend the free end of the band 90 degrees to the clip. 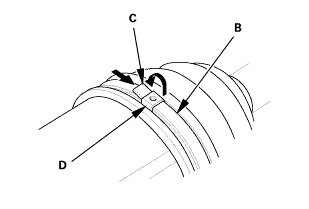 Fold over the remaining tail onto the clip. 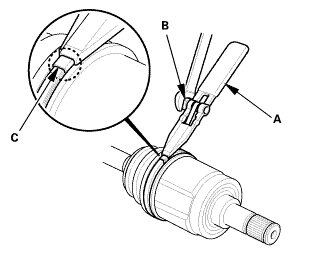 Unwind the boot band tool, and cut off the excess free end of the band to leave a 5－10 mm (0.20－0.39 in) tail protruding from the clip. 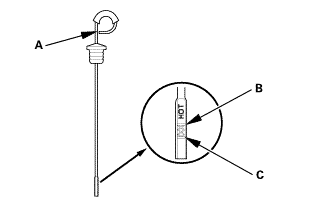 Bend the band end (A) by tapping it down using a hammer. 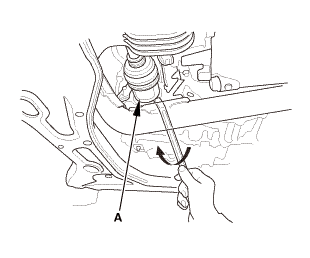 Make sure the band and the clip do not interfere with anything on the vehicle, and the band does not move. 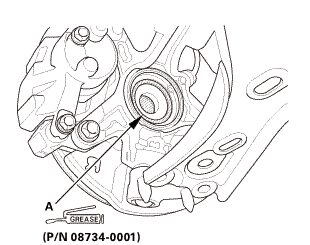 Clean any grease remaining on the surrounding surfaces. 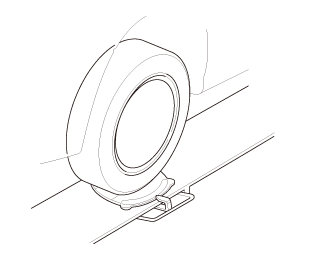 Install a new low profile band (A) onto the boot (B). Hook the tab (C) of the band. 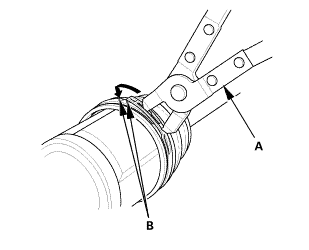 Check the hook portion of the band using commercially available boot band pliers (A). 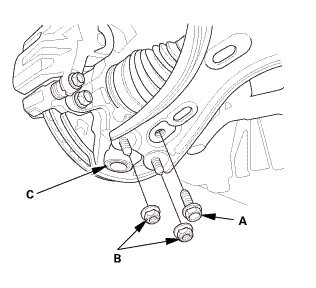 Hook the tabs (B) of the band.